It’s a tough nut to crack for bloggers, businesses and brand managers. Online reputation is totally outside of control — it’s in the reader’s and customer’s hands, they can push a company to the highest ranks or lead it to sink, online and offline. But does it have to be so tragic? Is reputation really something you can’t do anything about and you should just bear with? Finding this out is exactly where it can go from tragic to enlightening and where you can do something to keep your brand’s reputation at its best no matter the hiccups. Here is a short checklist to guide you in online reputation management. Are there users who speak with hatred about the company? Are there some who could be considered fans or influencers? Do positive or negative comments attract the most reactions from the following? If so, in what ratio? Social media can offer plenty of elements to assess your company’s reputation and what elements to work on, so don’t ignore them. Respond to users who share negative feelings about your blog or company, reassure them and offer to help them. Get in touch with fans and influencers to show your appreciation of their efforts. Join user discussions on social media and forums and offer advice and clarifications wherever needed. Your reputation or that of people working under you in executive roles or any other public roles does count in business. A scandal hitting you personally or one of your subordinates may hinder the image users or customers have about your brand — brand and person association happens and it’s difficult to erase. Also, it is a time-consuming process. Make sure to talk to your subordinates and collaborators about their public image and to keep private things private wherever possible. See tip #6 in this checklist. Website mentions and backlinks, and the context surrounding them, are important factors for your business reputation. Is the context positive or negative? Is it a news article, an opinion piece or a review? Are there comments or reactions to the content piece? If there’s any, does it favor your brand or not? Reputation also depends on the authority of the linking or citing source: the higher the authority, the heavier the weight of the opinion for your brand’s overall reputation. Don’t wait for discontent and disappointment to sink in and create damage in your brand image: if you or your team committed a mistake that lead users or customers astray and created discontent, act promptly to fix the issue and restore the image. Also, make sure these issues are appropriately addressed in the media, especially on the company blog. Respond to interviews and explain what you did to fix any temporary ethics or quality issues. Review-centered websites like Yelp or Amazon make it actually easy to manage your company’s online reputation. Take some time every week or two weeks to read reviews and respond to them. Thank reviewers for the time spent to leave feedback and let them know about your latest discount or another offer they might be interested in. Also, let them know how helpful their feedback is for your efforts to improve your offerings and how you communicate with users or customers. Read what Susan Adams says in her article at Forbes. It’s easy to tell too much online, to show too much, but when you have a business image to protect, you will want to be moderate in how you speak and behave in public and avoid all those situations that will put your persona and your business in trouble. Also, make sure anything you put out for public view outranks and outnumbers anything negative other people (or even you, inadvertently) put out before. Second tip: If somebody is upset, focus on converting that person into an evangelist. The alternative is letting her rant and stew and possibly turn into an angry mob. Evangelists are preferable to angry mobs. Third tip: A satisfied customer is an unfulfilled review or testimonial. Ask for the review. Ask for the testimonial. Ask and you shall be fulfilled. 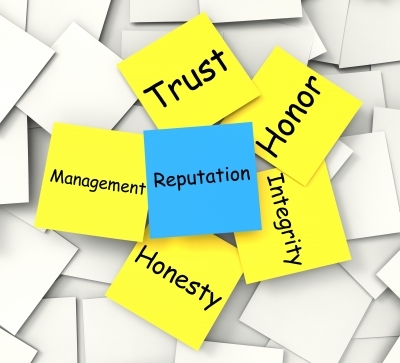 How do you manage your brand, blog or company’s online reputation? Share your story in the comments below.